In 1953, the Archives Section of the Canadian Historical Association was born. A decade later, Hugh Dempsey, the first editor of The Canadian Archivist, argued that “the Archives Section feels it would perform a useful service by publishing selected papers and bringing information on archival techniques, policies and practices to the attention of its members.” This “useful service” has been performed admirably ever since, by The Canadian Archivist from 1963 to 1974 and by Archivaria since 1975. In 2015, Archivaria will celebrate its 40th anniversary. 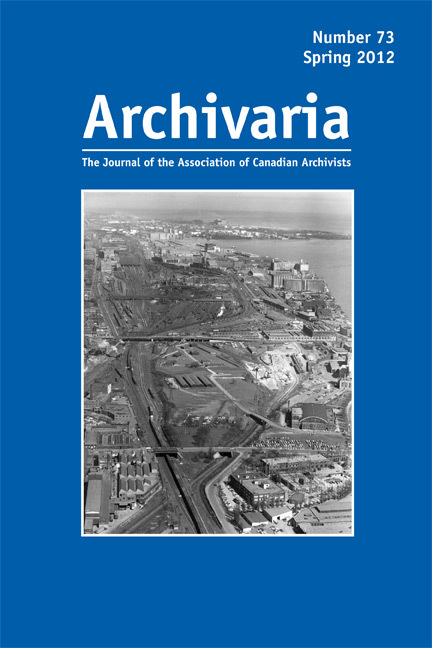 In honour of this milestone event, the Archivaria Editorial Board will publish a special issue of Archivaria offering reflections on the state of archives, the archival profession, and the archival discipline in Canada. Building on the perspective of the Symons Report, this issue will look at the past, present, and future of archives in Canada, the place of archives in time and space, the responsibilities of archivists – to ourselves and to others – and the nature of the archivist in the 21st century. speculations on the future of the profession and discipline. Deadline for expressions of interest: Expression of interest consisting of an abstract of the proposed article (300-500 words) must be received by Archivaria Editorial Board representative Laura Millar by 14 November 2014. Submission guidelines: Final submissions should follow the “Advice to Authors of Submissions to Archivaria” athttp://archivists.ca/content/advice-authors-submissions-archivaria. Deadline for complete manuscripts: Complete manuscripts are due 30 April 2015. Please feel free to direct questions related to this special issue to the Editorial Board representative, Laura Millar. T.H.B. Symons, To Know Ourselves: The Report of the Commission on Canadian Studies, Association of Universities and Colleges of Canada, 1975, p. 12.